We're going to bring back interesting NPCs and character development to the mobile simulation genre. 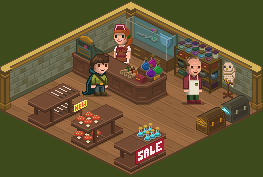 Here are the new Shopkeepers we just created and the little shop they own inside your wizard academy. The characters and the shop will change frequently, so it feels more alive than your usual in-game shop.